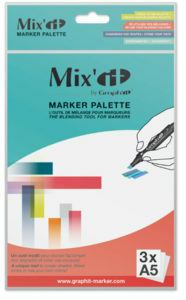 The GRAPH’IT colour chart becomes infinite with the Mix’it by GRAPH’IT marker palette! The essential accessory for mixing! The Mix’it pallet is a translucent sheet made of a non-porous, tear-resistant synthetic material. Because this paper retains the ink from the markers and is waterproof. 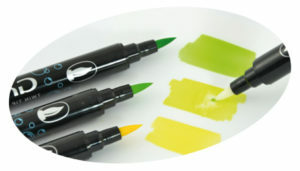 It is the perfect tool for mixing alcohol-based markers or water-based markers. Use your Blender GRAPH’IT marker as a brush: work on your colours until you obtain the desired shade, then pick up the mix with the blender and apply it on your drawing. You can also just pick up a single colour to create shadings. Because the colour stays on the surface of the non-porous palette, you can go back to a colour months later and reactivate it with the blender. 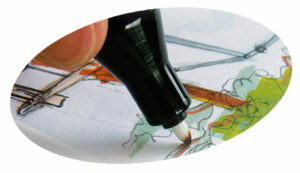 The use of the Blender is ideal for detail work and shadow retouching in particular. Blender mixes can be used to obtain pastel or extremely light shades. In this way, traditional gradients can be better mastered beforehand on pallets and then applied on paper. Mix’It also allows you to archive your own colours: even when dry, the mixes can be reactivated simply by using the Blender. In this way, the shades created can be preserved and re-used. The GRAPH’IT colour chart no longer has any limits! Easily create new shades of tints according to your desires with this palette. Reusable, the palette can be cleaned with alcohol or with the Mix’it Fluid.